A site visit from the engineer to verify application and insure the design meets the needs of the customer..."what's this world coming too"?! One step further, the engineer manages and leads the installation/erection of the shoring when required. "Now I know I'm delusional." Spirit Scaffolding, LLC shoring projects are inclusive of the very best 'hands on' in the industry. 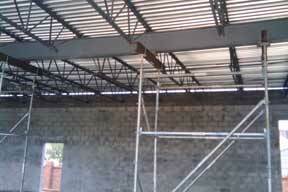 Shoring by Spirit Scaffolding, LLC is under the expert direction of R.J. (Bob) Pastermack, P.E. a state certified engineer with 13 years experience in construction management at Kennedy Space Center and 24 years plus experience in the scaffolding and shoring industry. Using creative planning, the best shoring systems available and experienced scaffolding erectors, Spirit Scaffolding, LLC is able to solve your shoring issues with speed and safety. You are not delusional. Welcome to the shoring industry, as per, Spirit Scaffolding, LLC. Contact us today for fulfill your shoring needs.